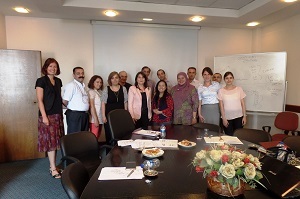 The Study Visit was paid by Mrs. Irma SUNDARI, Head of Section of Financial Institution Statistics, and Mrs. Hana DWI KRISTANTI, Staff at Subdirectorate of Capital and Foreign Account, BPS-Statistics Indonesia. As defined in the Classification of Statistical Activities (CSA Rev. 1 - October 2009; http://goo.gl/olg3Tz); Banking, insurance, and financial statistics covers money, banking and financial market statistics, including financial accounts, money supply, interest rates, exchange rates, stock market indicators, securities, bank profitability, private sector insurance and pension fund statistics, and Financial Soundness Indicators.